Ultraterm HA(IRHA) modular dryer for water-based varn. 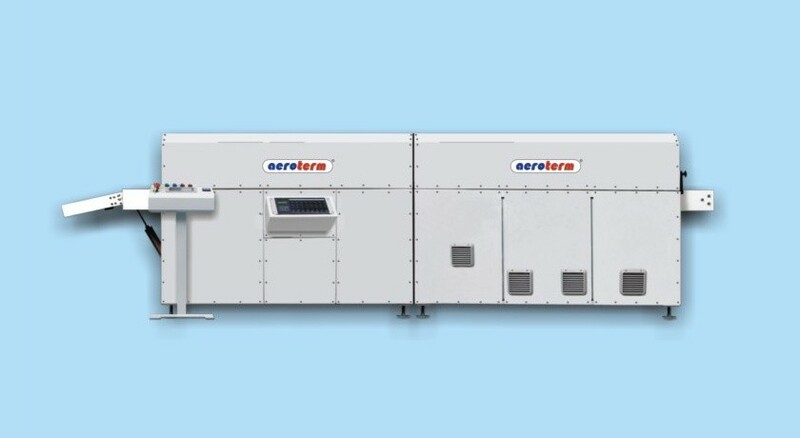 HotAir dryer for safety drying of solvent based inks printed on the different kinds of materials. Dryer consists from loading section, one or more HotAir sections with undepended temperature regulation , cooling section and unloading section with belt drive. The equipment used the high-speed high-turbulence flowing in the HotAir and cooling section - this fact allowes the minimalization of the mechanical dimensions and energy requirements of the whole equipment. Very high level of accuracy in adjustment and keeping of the pre-set temperature is guaranteed by the most modern type of temperature regulation with automatic tuning of control parameters. Control system used is characterised by very fast and exact rise to the pre-set temperature without temperature over-oscillation and by very precise keeping of the pre-set temperature. The belt drive is through the threephase careless electromotor controlled with the frequency invertor. The speed of the belt can be read on the display of the controlling panel. The dryer conveyor is equipped with belt made from the fibreglass fabric, PTFE covered, with high mechanical and temperature resistance. The printed material is aerodynamicaly fixed on the belt. Perfect fumes exhausting. The controlling box with safety central STOP button and main switch of the equipment. The perfect noise insulation, top function, simple operation, modern design. The dryers design and operation agrees with all needed regulations of Europe Union countries and the equipment has CE declaration. The equipment is confirm by certificated authority from the point of view of safety drying of flammable materials.